A production–possibility frontier (PPF) or production possibility curve (PPC) is a curve which shows various combinations of a set of two goods which can be produced with the given resources and technology where the given resources are fully and efficiently utilized per unit time. One good can only be produced by diverting resources from other goods, and so by producing less of them. This tradeoff is usually considered for an economy but also applies to each individual, household, and economic organization. Graphically bounding the production set for fixed input quantities, the PPF curve shows the maximum possible production level of one commodity for any given production level of the other, given the existing state of technology. By doing so, it defines productive efficiency in the context of that production set: a point on the frontier indicates efficient use of the available inputs (such as points B, D and C in the graph), a point beneath the curve (such as A) indicates inefficiency, and a point beyond the curve (such as X) indicates impossibility. An example PPF with illustrative points marked PPFs are normally drawn as bulging upwards or outwards from the origin ("concave" when viewed from the origin), but they can be represented as bulging downward (inwards) or linear (straight), depending on a number of assumptions. A PPF illustrates several economic concepts, such as scarcity of resources (the fundamental economic problem that all societies face), opportunity cost (or marginal rate of transformation), productive efficiency, allocative efficiency, and economies of scale. An outward shift of the PPC results from the growth of the availability of inputs, such as physical capital or labor, or from technological progress in knowledge of how to transform inputs into outputs. Such a shift reflects, for instance, economic growth of an economy already operating at its full productivity (on the PPF), which means that more of both outputs can now be produced during the specified period of time without sacrificing the output of either good. Conversely, the PPF will shift inward if the labor force shrinks, the supply of raw materials is depleted, or a natural disaster decreases the stock of physical capital. However, most economic contractions reflect not that less can be produced but that the economy has started operating below the frontier, as typically, both labor and physical capital are underemployed, remaining therefore idle. inside the eclipse (Green color) is inefficient. on the eclipse line is efficient, or maximum efficiency. outside the eclipse (TEAL color) is not possible. The other concept illustrated is the opportunity cost. From a starting point on the frontier, if there is no increase in productive resources, increasing production of a first good entails decreasing the production of a second, because resources must be transferred to the first and away from the second. 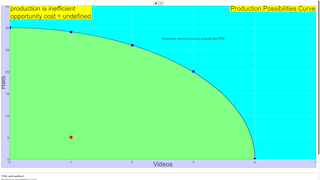 Points along the curve describe the tradeoff between the goods. The sacrifice in the production of the second good is called the opportunity cost (because increasing production of the first good entails losing the opportunity to produce some amount of the second). Opportunity cost is measured in the number of units of the second good forgone for one or more units of the first good. 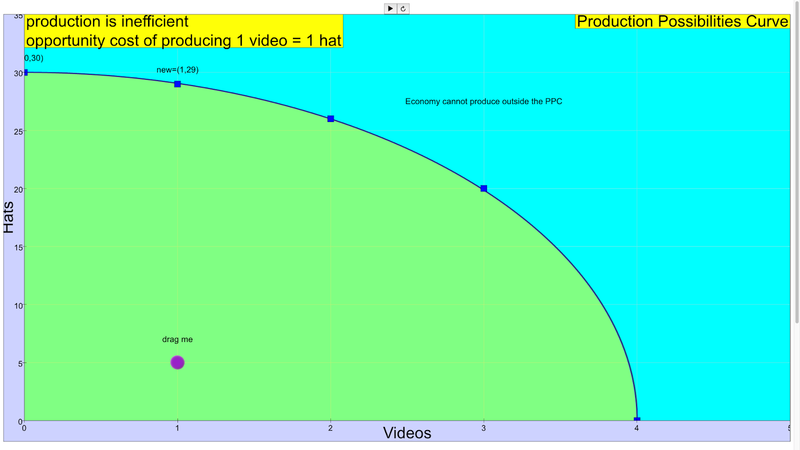 In the context of a PPF, the opportunity cost is directly related to the shape of the curve (see below). For example, to produce 1 more video from 3 videos, 20 hats must be sacrificed. The ratio of gains to losses is determined by the marginal rate of transformation.